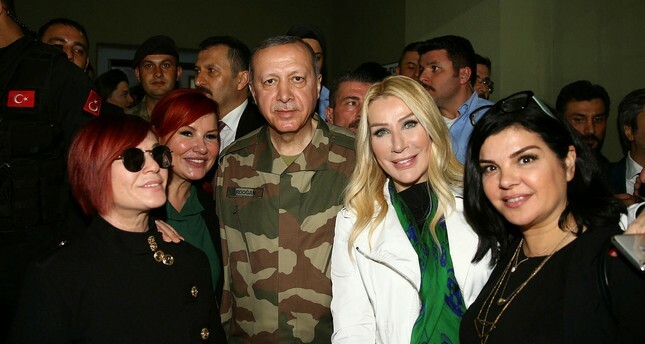 Turkish celebrities on Sunday visited a province bordering Syria along with President Recep Tayyip Erdoğan to meet and support soldiers taking part in Turkey's counter-terrorist Operation Olive Branch in northwestern Syria. Among the luminaries visiting Hatay, southern Turkey were singers Ibrahim Tatlıses, Ajda Pekkan, Yavuz Bingöl, and Sibel Can, basketball player Hedo Türkoğlu, motorcyclist Kenan Sofuoğlu, actress Hülya Koçyiğit, and actor Necati Şaşmaz. The group was welcomed with cheers in Antakya, one of Hatay's largest cities. Turkish singer Alisan told Anadolu Agency that all Turks -- including athletes, singers, and actors -- support Operation Olive Branch. He said they also want to visit Turkish soldiers in Hatay. "We owe a lot to our soldiers who fight for their country, flag, and for us. We would be happy if we could cheer them up," he added. Singer Ahmet Şafak said they were in Hatay to thank the Turkish soldiers. "We will share our determination for the indivisible unity and future of our country with our fellow soldiers," Şafak said, highlighting their solidarity with the soldiers. Actor Şaşmaz also reiterated that they were in Hatay to support the soldiers. "We say we're here to give our soldiers moral support, but I don't think they need it. I believe they're really happy," Şaşmaz said. Wrestler Taha Akyol said they want to show their support for the soldiers and security officers taking part in Operation Olive Branch. "It's an important day to give messages of unity to Turkey and the world with our president. Our prayers are with them," he said.